What is the perfect fit guarantee? Each of our suits is carefully crafted based on your measurements. When you get it, it should fit like a glove. If it doesn't we'll make every effort to ensure that it does. Whether that means covering reimbursements for the alterations or replacing a defective suit, we'll do it. Our goal is to get have your exact measurements on file for the future. If you have to make a change, let us know. On your next order, no measurements will be needed. Just choose your style, fabric and lining and we'll have the next one in the mail ASAP. Not only will it be an easier process on your end, it will also be PERFECT. Is there free shipping with all orders? All suit orders receive free shipping. Any shirt orders over $300 will receive free shipping, while any orders under $300 will be $8. What currency are the prices listed on your site? all prices listed are in Canadian Dollars. When you check out, the price on your credit card will reflect your local currency. How do I measure? Measuring is an important process, but you can definitely do it at home! Follow our How-To Measure video, guide and pictures and you can have yourself measured in 15 minutes. If you're located in Halifax, Nova Scotia, give us a call at 902-499-2534 and we'll stop by your home or office to complete your measurements for you. Do you offer refunds or exchanges? If there is a defect in the craftsmanship of your new suit and it is unable to be resolved by a tailor locally (at Modern Suiting's expense) please contact sales@modernsuiting.com. We will arrange to have the suit returned for free and a new one created immediately. How do you offer custom suits at this price? It's simple, we cut out the middle man and don't have to pay huge rent and commissions to sales staff. I've ordered a suit from Modern Suiting before, do I need to measure again? We keep your measurements on file for 5 years. If you feel you're the same measurement as before, input your client ID (from your previous invoice) and we'll use the same measurements. There are a few wrinkles in my suit, what should I do? As much as we try, there is no way to ship our suits and not have a single wrinkle. You have two options, have your Modern Suiting pressed at a local dry cleaner or invest in a home steamer. I bought one and it saves me a lot of time in my morning prep. How will the suit be shipped? We send all of our suits with international courier services. Once the suit has been shipped, you will receive notification in an email plus the tracking number. The tracking number often doesn't show everything for the first few days. Stay calm, it's on the way but you'll need to wait a couple of days before you can track it. I don't live in Canada, can I still order a suit? Yes, we will ship your new suit anywhere in the world. Free. Can I give a suit as a gift? If you happen to know every possible measurement for that special someone go for it! If this is going to be a surprise, contact us and we'll set up a gift card for that special someone. What is the difference between a Notch Lapel and Peak Lapel? 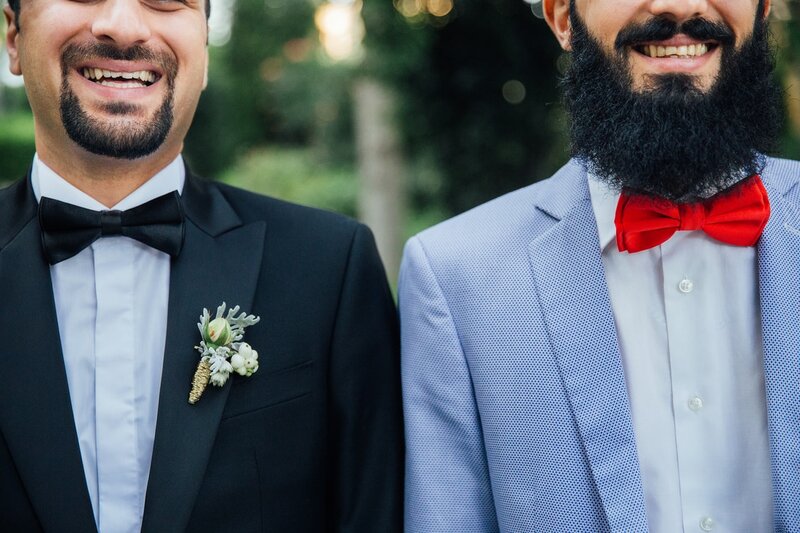 The gentleman on the left has Peak Lapels, and the gentleman on the right has notch lapels.